Directed by Garry Ross, starring Matthew McConaughey, Gugu Mbatha-Raw, Mahershala Ali and Kerri Russel. A confederate army deserter, Newton Knight (McConaughey), returns home to Mississipi and leads a group of fellow deserters in an uprising against the local Confederate Government. The film opens with the words “Based on actual events in Jones County, Mississippi – 1862 to 1876”. That is a huge span of pivotal American history to try and incorporate into a single film. A period that witnesses the revolt of deserters against the Confederate government. The political struggle for the rights of black people by initiating the process of trying to secure their freedom in the state, fighting for their right to vote, and dealing with the uprising of the KKK. Before finally exploring the apartheid in the state that forbade interracial couples and explores its effect on future generations. To sufficiently, and satisfyingly cover so much integral American history is highly ambitious, and though the film clearly has the right intentions, Garry Ross has somehow made one of the most boring films I have ever seen. The film becomes almost insulting to the story it is trying to tell, by placing such focus on McConaughey’s character and his life story, it seriously neglects some of the much larger issues that should instead be the focus of the film. The film is 2 hours and 19 minutes long, which initially you accept, owing to the depth of the subject matter. However, so much of the film is lost in shots that are either far too long, or scenes that spend far too much time focusing on the wrong material, and certainly the wrong subject matter. As I say, 2 hours and 19 minutes is a justifiable length of time to spend on this subject matter, but it also needs to be responsibly allocated, which Ross and his editors rather failed to do. There was one moment in fact where I struggled to stay conscious when, during one scene where the young daughters of a family are learning to read, “Cat, Mat, Sat” are said in a rhythm reminiscent of counting sheep. This, in turn, neglects the intention of the scene where the black woman owned by the family is watching through a crack in the door to also learn to read. Initially, you are thrown straight into the action with McConaughey who is, very briefly it must be said, playing a medic. He soon discovers a young relation of his is also fighting and wishes to leave, a plan is conceived between them, but before the two can successfully execute the plan, the young boy is shot and killed. This scene is a fantastic summation of this film, the symbology is there, a young boy who should not be fighting, who is scared, and who is taking part in a war he does not fully comprehend, a case that can be applied to nearly every war in existence. However, owing to the rushed narrative, the film fails to connect us to him within the context of this scene, so we feel empathy for the image he represents rather than his actual character and how he affects the film as a catalyst for McConaughey’s character. These moments can be found sporadically placed throughout this overly long film, really quite powerful uses of imagery and symbolism, which work fantastically as independent scenes, but fail to add anything to overall narrative feeling because you must endure 20 minutes of tedious shots of McConaughey looking pensive. As I have mentioned, the editing is atrocious in this film, far too many pretentious self-indulgent scenes are given to McConaughey’s character Newt. Including one overly long scene depicting his life in a swamp. Though character development is crucial in these films, it is an element this film fails for any character other than McConaughey’s. It is hard to justify filming so much of Newt’s life in a swamp when 10 minutes from the end of the film, it introduces the KKK. Ross would seriously fail in any time management course. Now I fully accept that I may not be the target audience for this film, this is narrative steeped in American history, and therefore this may not be intended as a film for one such as myself. In the same regard that some American’s may become bored whilst watching say the Netflix drama ‘The Crown’ which I personally found enchanting. So perhaps I have misunderstood why this film is really quite so slow through long periods of the film, perhaps this serves a purpose and I have horribly misjudged it, but it does feel like an eternity passed whilst I was sat and watching this film. Quite possibly this project would have benefited from a similar format to ‘The Crown’ thereby enabling us to skip large sections of tedious non-information and to those sections that actually contain substance. The cast is also quite frustrating, though not a direct criticism of their work, but I know Mahershala Ali and Keri Russell to be fantastic actors from previously watching their work, but the entire cast feels far too comfortable in their roles, none this is a stretch on their acting ability. Russell and Mahershala, in particular, are absolutely wasted in these roles, both are becoming household names with Russell’s work in The Americans, and Mahershala in House of Cards, Luke Cage, Moonlight and Hidden Figures. For two individuals who have such screen presence, is it frustrating as a viewer to see this frittered away quite so quickly. I have now watched two war films back to back, one was gripping and emotionally fantastic to watch, and one very nearly sent me to sleep at times. I will leave it to you to work out which comment belongs to which film. OVERALL * Far too long, self-indulgent and at times bordering on outright pretentiousness. This focus on McConaughey’s mad weekend, distracts you from some of America’s far more interesting moments in history which are lost in one of the longest and slowest films I have ever seen. RECOMMENDATION – If you’re American, then watch and let me know if you enjoyed this film, I would genuinely be interested. Otherwise, go and watch anything else. Judging from your review, you were obviously expecting some action-packed blood and guts war movie and you got a realistic study of the Civil War’s impact on poor Southern whites and maroons (runaway slaves), a true story that, I grant you, should have been mini-series long to do justice to the extraordinary lives of Newton and Rachel Knight and his Knight Company. You also got the first accurate depiction of Reconstruction ever filmed. Even Americans – and particularly Southern Americans with their misplaced nostalgia for the “Old South” – were unaware of the actions of Southern Unionists during the Civil War. The film was a shock to the system of most US film reviewers as they were so ill-informed about the Civil War in the South from any point of view but the neoConfederate nonsense Gone with the Wind and the “Lost Cause” it promoted blatantly (rich white Southerners, happy slaves, etc.). While the courtcase involving Davis Knight, Rachel and Newt’s great-grandson was significant in the history of civil rights and the precursor to the Loving case (about which a movie was recently made), and Ross obviously wanted to incorporate it into his narrative, the insertion of the flash forwards was awkward and broke the rhythm of the film. This wasn’t a war movie as much as it was an elegy for a brief moment in history when both racial and gender equality (white and black women fought side-by-side with men in the Knight Company) were achieved in the Free State of Jones. The film’s tone was justly mournful and I think it achieved it. With regard to your discounting Mahershala Ali’s performance (and not even mentioning Gugu Mbatha-Raw’s), I found his performance with the character’s extraordinary arc from maroon to combattant to literacy and activism and ultimately to martyrdom, devastating. His Juan in Moonlight was very good but didn’t match the work he did in Free State. Oddly, Moonlight and Free State had a similar mournful tone in common – and neither respected a traditional narrative flow. Firstly, thank you so much for commenting on my blog, it really does mean a great deal to me. Secondly, I honestly wasn’t expecting an action-packed blood and guts war film. Though perhaps my mind was tainted slightly with having just watched Hacksaw Ridge, and judging from your comments it was an unfair comparison. I think most war films set in WWI and beyond are action-packed and quite self-contained as seen in the Cillian Murphy film, Anthropoid. So I suppose in comparing it to Hacksaw Ridge I was expecting a self-contained war film. 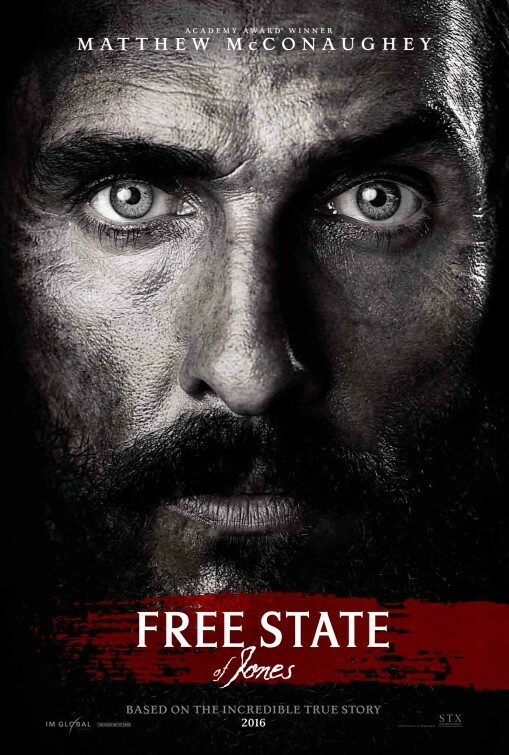 I must confess I had never heard of Free State of Jones until I saw the posters, and I was under the impression that this was going to be a film primarily about freeing slaves. I will take your word for it, that this is, as you say, the first accurate depiction of reconstruction filmed, however, I feel it should have focused less on Knight and more evenly spread amongst other more compelling characters and other parts of this history. Perhaps then I would have been in a better position to enjoy Ali’s and Mbatha-Raw’s performances. Yes, the flashforward sequences were jarring, perhaps they should have been placed at the end of the film as a reflection of Knight’s actions. Or maybe at the start of the film when Newt’s name is first mentioned in court, the scene could transition back in time to his character. Either way, it was poorly adapted by Ross. Granted I can see this as an elegy, and there were striking moments during the film. But as I said in my review there were also really overly long shots of Newt that felt quite self-indulgent and frustrating when towards the end of the film, historical photos from these events were used which then lost their weight and power. That mournful tone is necessary, but it does make for difficult watching over this length of a film, they needed more range to support the more powerful moments in this film. I didn’t mention Gugu Mbatha-Raw’s acting because while it was good, her performance was somewhat lost to me, something I potentially overlooked but which I blame on the director. Although I agree Ali’s character’s arc was interesting, particularly at the end, of course, it was also lost in far too many shots of Newt, if the film had been more compacted with better editing, then yes I would have felt his narrative far more than I did. However, Moonlight was both far more visually stimulating and intelligently made so for me Ali stood out prominently. In Free State of Jones, I felt he had very little to do until towards the very end, by which time I must admit was struggling to maintain my interest in the film. Again, I must thank you for your comment and would be delighted to hear from you again.